//How can you inspire gratitude in your "choosers?" In our role as trend analyzers, we read a lot of trend research and at the beginning of each year we pay particular attention to the pundits and prosthelytizers. This is the second in our four-part series that features mash ups of some of our favorite predictions of 2016. Gratitude is the next incarnation of loyalty. Or, put another way, what happens when customer delight meets health care and patient experience? In the article Mark asks, “What would the world look like if brands were loyal to their customers?” We started to wonder that same thing, but in the context of health care. It seems like the perfect proving ground for this idea. What if healthcare providers were loyal to patients and their caregivers? Bonchek also identifies expressing authentic appreciation as a component to fostering gratitude. 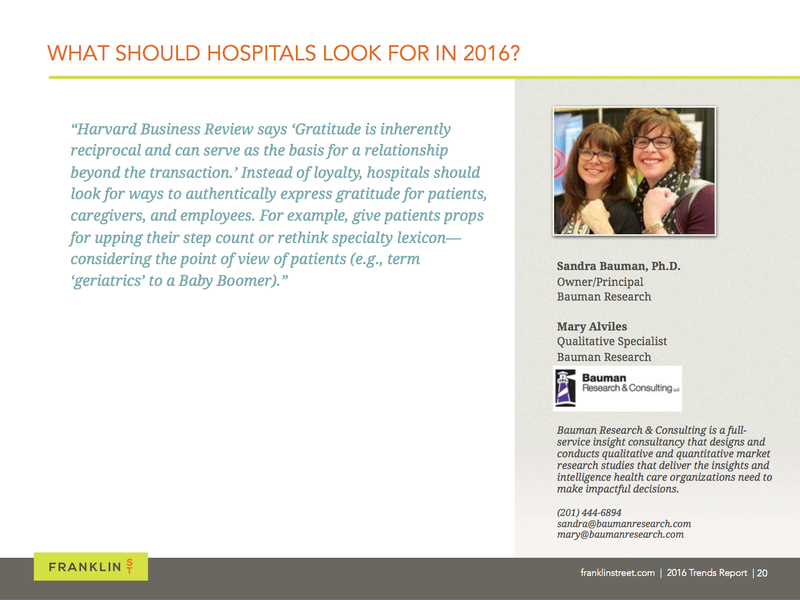 Mash up alert: who better to empower to show patients appreciation than the front-line staff? For the past several months we’ve been talking about applying Danny Meyer’s enlightened hospitality approach to market research. 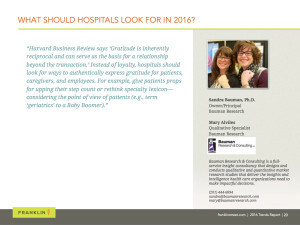 In doing so, it occurred to us that if health systems and hospitals developed a strategy for empowering their front-line staff, trained them in how to employ passive listening, and gave them the discretion to provide patients and their caregivers with “extras” and appreciation, patients would be so thoroughly delighted they would have no choice but to rave about and reciprocate with gratitude (and likely surprise as well)! Voila! Positive word-of-mouth! This may seem like a strategy that is already in place in health care, but unfortunately employee engagement remains a very real and unresolved opportunity for improvement for many systems.